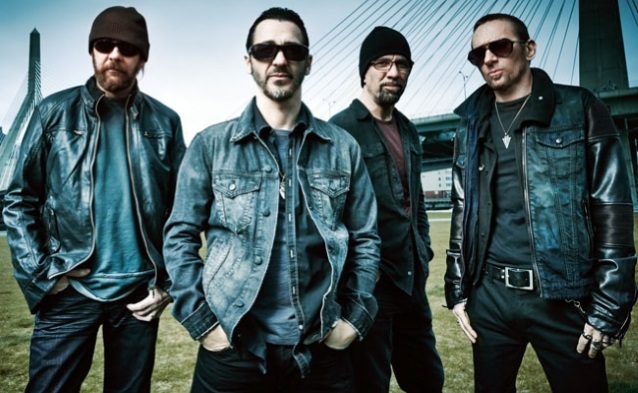 GODSMACK will enter the studio early next year to begin work on the follow-up to 2014's "1000hp" album. The band started to wind down the touring cycle for "1000hp" last year and played its only show of 2016 this past weekend at the Moondance Jam in Walker, Minnesota. Asked by Gunner and Chow of the Q105.1 radio station in Fargo, North Dakota if there are any plans for GODSMACK to release new music soon, guitarist Tony Rombola said: "Not this year. We're gonna start at the beginning of next year." While GODSMACK is on a break from touring, Rombola and drummer Shannon Larkin are focusing on their new project called THE APOCALYPSE BLUES REVUE, whose self-titled debut disc is due out on August 26. "If we had a new [GODSMACK] record out, we'd be all hands on deck, but when we have a year off plus, I can't stay home and just drop-tune GODSMACK songs; I've gotta do something different," Rombola told Q105.1. "'Cause I play a lot of different styles, so it's a good way for me to stretch out musically." As previously reported, GODSMACK frontman Sully Erna has set "Hometown Life" as the title of his second solo album. Although a firm release date has yet to be finalized, the disc will arrive sometime later this year. Erna has also unveiled the cover art and track list for the ten-song collection, which will follow up his 2010 solo debut, "Avalon". GODSMACK last year released a new song called "Inside Yourself" as a free download at the band's official web site. Erna said about the track: "This is a song about equality for all! Understanding that no one is worthless or any lesser than the next person. We are all equally important as human beings and should be treated that way. And for those of you who feel the need to cut others down to make yourself look superior, you seriously need to take a good look 'inside yourself.'"